'I Failed,' Says Rupert Murdoch; But He Points At Others For Cover-Up : The Two-Way Media mogul Rupert Murdoch testified today that lower-level executives were the ones behind a cover-up of the so-called hacking scandal and that they kept him from knowing about what had happened. 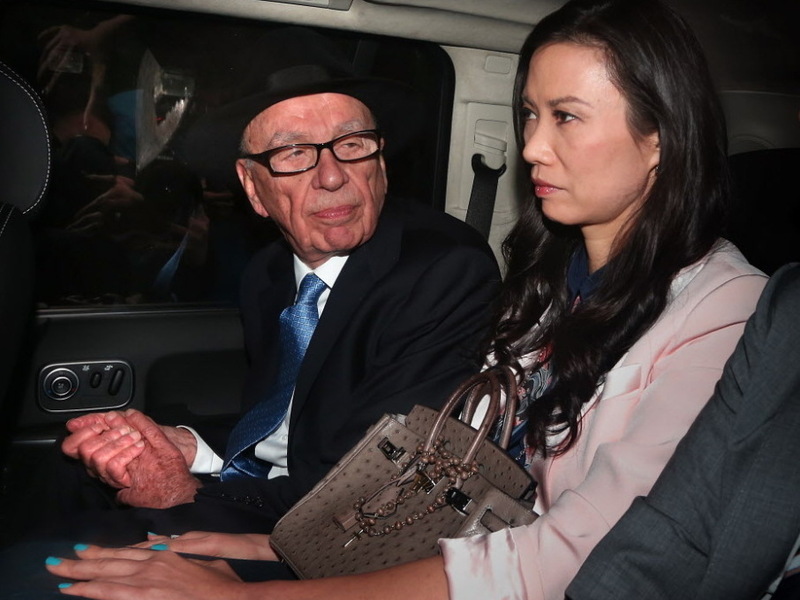 Rupert Murdoch and his wife, Wendi Deng Murdoch, as they were being driven away from the Royal Courts of Justice following his testimony today in London. While conceding that "I failed" because some of his News Corp. tabloids in the U.K. were guilty of hacking into the phones of murder victims, celebrities and politicians, media mogul Rupert Murdoch also testified today that lower-level executives were the ones behind a "cover-up" that kept him from knowing about what had happened. Murdoch insisted during his second day of testimony in London that "he and his [top] executives were misinformed and shielded" from knowing about the so-called hacking scandal by others in the company, NPR's Philip Reeves reported earlier on Morning Edition. He didn't name names, but said some older employees at the newspapers played key roles in the cover-up. News Corp., as we've been reporting for nearly a year, has been engulfed in a scandal that began with word that one of the company's tabloids — News of the World — hacked into the cellphone of a missing teenaged girl (who later, it was revealed, had been murdered). Since then, evidence has emerged that the practice was far more common than realized. Now, investigators are focusing on signs that News Corp. engaged in some quid pro quo relations with British government officials. Wednesday, Murdoch said he has "never asked a prime minister for anything." The Guardian has been live blogging the inquiry here. As it notes, Murdoch said he was guilty of "not paying enough attention to the News of the World at any time I was in charge of it"
NPR's David Folkenflik continues to post updates on Twitter.